Comtel Technologies (Aust) Pty Ltd ('Comtel' - originally Comtel Pty Ltd) was incorporated in Victoria in 1968 to distribute, install and maintain Nurse Call, Inter-communications and Public Address equipment. Subsequently, the Comtel name became established in the Health Care Industry as suppliers of Australian-made Nurse Call and Communication equipment and systems. Comtel specialises in a range of low-voltage equipment & systems specifically for the Aged & Health Care Industries. Our aim at Comtel is to provide our customers with the equipment and services they require for their facilities. This ensures they are getting a high level of product reliability with the assurance that the systems will be compatible and work together as one complete solution. Our knowledge and experience ensures seamless integration of various systems. By combining installation of several systems, we can provide cost-savings to our customers. Our range of quality products & services are also suitable for use in Educational & Correctional Institutions; Commercial & Industrial premises; Apartments & Residential dwellings. As suppliers of intercom & communications systems for more than 40 years, we believe that our team at Comtel Technologies is in the best position to offer quality solutions for your communication needs. Secure access to buildings and properties is an ever increasing concern in this modern era and Comtel Technologies are able to supply solutions to address these concerns and enhance your security, providing peace of mind. Our aim at Comtel is to provide fully integrated electronic solutions for Architects, Engineering Consultants, Security and Electrical Contractors, Electricians and End-users. WHY DO PEOPLE BUY FROM COMTEL? ♦ Over 40 years experience as suppliers of communications systems since 1968. 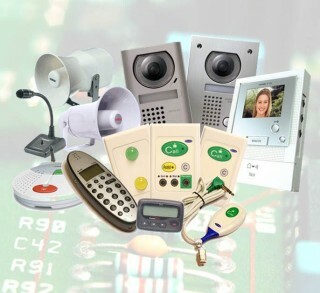 ♦ Extended warranty offered as standard on all ‘Aiphone’ intercom equipment. ♦ Technical Service Team for on-site service, workshop repairs & system modifications. ♦ Showroom with an array of functioning systems & custom panel examples on display. ♦ An attention to detail that has cemented Comtel’s place as a preferred supplier by many Security & Communications installers.